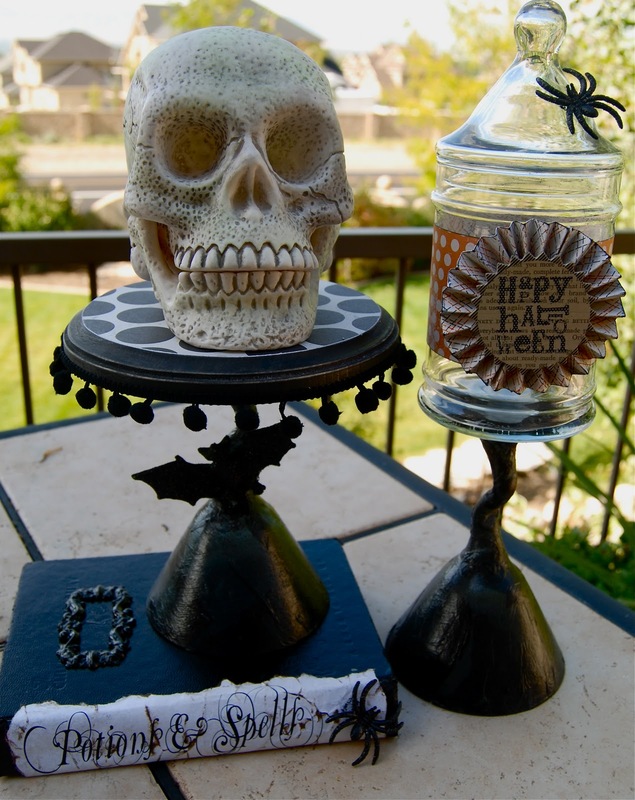 Shyloh Belnap: Today on Good Things Utah...“Spook”tacular Halloween Decorations! Today on Good Things Utah...“Spook”tacular Halloween Decorations! Cut a circle (I just cut one free hand and sloppy) slightly larger than the base. Mod Podge the circle to the top of the plaque and then use your sand paper to sand around the edges. This will sand through the paper so it is the same size as the circle! Adhere the pom pom ribbon around the bottom edge of the plaque. Mod Podge tissue paper onto the wine glass for a textured feel. I ripped pieces to adhere it and did not worry about being sloppy figuring it added more texture! Use spray adhesive and glitter on the bat. Attach the plaque to the top of the upside down wine glass with E6000 and attach bat as desired. Think of all the fun possibilities! You could make a cake stand for any occasion with this same process. You could also put a little tea light (battery operated, NOT a candle) in the base of the stand to make it glow, it will show through the tissue paper! Apothecary Jar. You can get them at Walmart, the Craft store, All a Dollar, use a food jar and spray paint the lid! Make the wine glass with tissue paper per the above instructions. Use Spray adhesive and glitter your plastic spider (what a cheap fun way to dress up a decoration)! Attach spider to the lid as shown. Cut a 2.5” strip of paper and wrap around the jar. Cut (2) 1.5” strips of paper and accordion fold them. Staple the ends together into a circle and use a glue dot to hold them together onto a circle you cut from scratch paper. Or, you could punch holes on the inside and use a thin floss to “sew” it together in a circle. Add a cute chipboard embellishment on the front and glue to the jar. 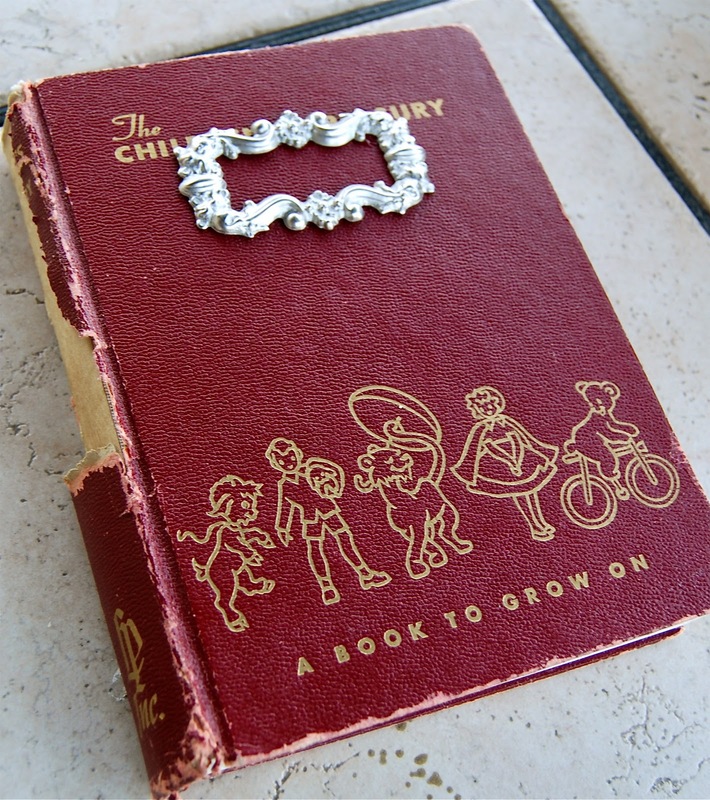 Attach the book plate onto the front of the old book. 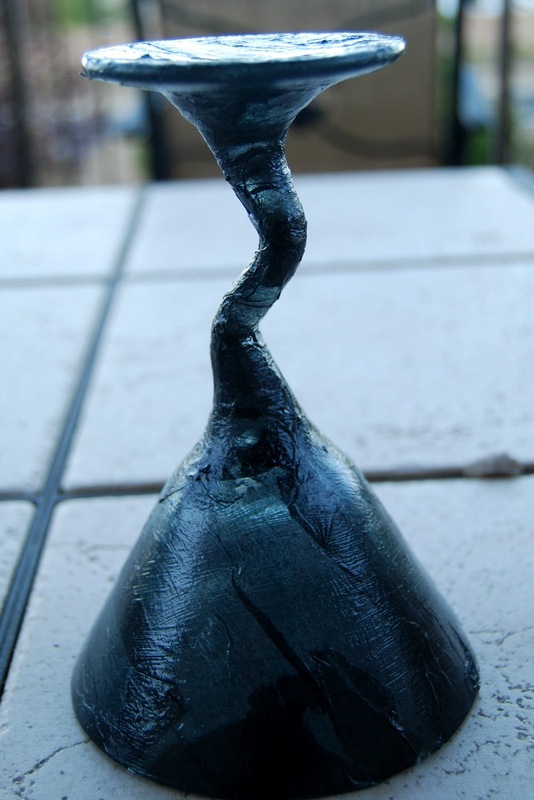 Spray paint the whole thing black! Tear the title so it looks old and distress with brown ink. Attach with spider to the spine. Here is the Potions and Spells title I used. Just drag it to your desktop if you have a Mac. If you are on a PC, click on the image so it comes up in a separate window. Right click on the image and save it to your computer! Cute cute cute projects! And easy to make too!